Hey Everyone! My name is Ellie Minihane, I attend Belfast MET and I am studying level 3 extended diploma in health and social care. This course provides with the skills and knowledge I may need in the health and social care field as well as (hopefully!) provide me with the grades needed to attend university. I was drawn to Cara-Friend initially as a young person, I had heard about it through some of my friends that knew I was identifying as bisexual and I thought it would be a good way of meeting new people while also educating myself more on the other people in the LGBTQ+ community. I had attended Cara-Friend for almost two years and in that time I have came out to all my family and friends, who are very accepting. 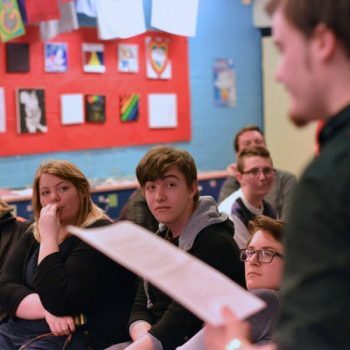 I thought Cara-Friend would be great for my work placement as I want to be a youth worker, and the addition of it being an LGBTQ+ inclusive youth service was a massive plus. I also wanted to get more of an insight into what youth work is, as my course is more health care based than social care. The placement as a whole was very interesting, my initial perceptions were challenged when I learned that being a youth worker isn’t just bashing out a few workshops or making sure the young people aren’t fighting each other every two minutes, from what I seen it involved active planning for groups, arranging facilitators and working closely with volunteers and staff to achieve an overall goal. On my first day I observed the Family Ties Group, a peer support group for parents of LGBTQ+ children and helps them to understand more about what their child may be going through, to educate them more on the LGBTQ+ community and most importantly to give them a voice and to ask questions that they may not feel comfortable asking their children. There are parents from all backgrounds that want to accept and understand their children to be the best they can be for them. It really opened my eyes to see how parents from religious backgrounds or from non-LGBT affirming backgrounds wanted to educate themselves and to be a source of guidance to help their children. This was probably one of my favourite parts of my placement, I was able to see how the LGBTQ+ community is viewed from a parent’s perspective. It was a very heart-warming experience. I then went to BYTES to sit in on an LGBTQ+ Awareness training session about the inclusion of LGBTQ+ young people who attend youth groups and how to help support them. The training involved how to give advice on how to change the worker’s language to be more inclusive of people part of the LGBTQ+ community feel more included. For example you would replace ‘girlfriend’ and ‘boyfriend’ in your day-to-day language with the gender-neutral term ‘partner’. These little things can make a big difference in how someone feels as they then don’t feel more pressured to open up any more than they need to. The training session also helped to educate other youth workers on gender identities and sexuality. The youth workers themselves were quite open and if they got confused they would ask questions and try to get a better understanding as most of them had little to no understanding on the LGBTQ+ community. I feel that the training session was a success, people went away with more knowledge and understanding and will hopefully try to make their youth groups more inclusive and supportive towards LGBTQ+ young people in Northern Ireland. 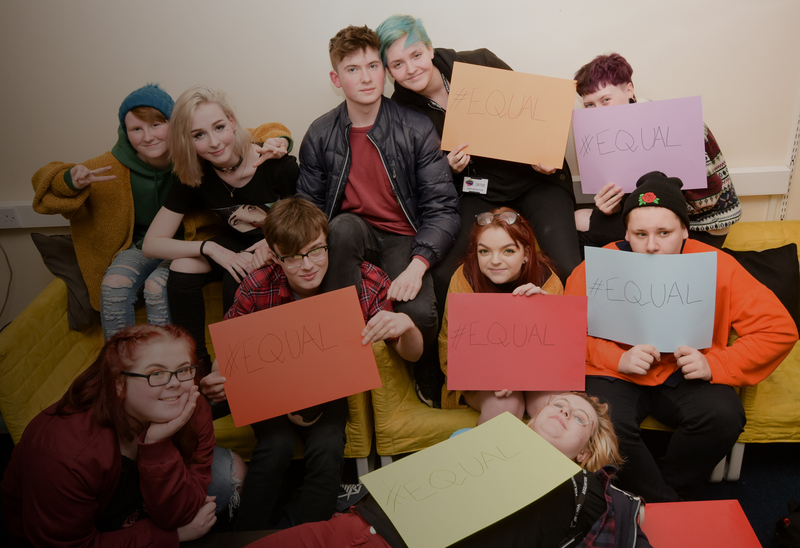 I attended a ShoutOut workshop at Springboard in Belfast, this was a workshop about sexual orientation and gender identity with the young people who attend springboard. I had expected it to not be the best of topics to bring up around these young people as I thought they would just make a joke out of it all, but to my surprise most of them where very respectful and did generally have a good idea about what being LGBTQ+ meant but there was still a few stereotypes that were floating about but that was challenged and overcome in the workshop. A standout part was a question asked about school and how accepting they were if someone had came out within the school. The answers were quite concerning, most people said their school was not a safe space to come out in as the person would be bullied physically and verbally and teachers didn’t seem like they would be much help as they really didn’t have a good understanding on how it feels to come out and get such a negative response. I think this needs to change and if it does it could have a big impact on Northern Ireland as a whole, I think if teachers and students where more educated and teachers received training on how to support a child who is willing to come out in the school could really make a difference I also think uniforms should be made more unisex and there should be none gendered toilets for transgender children who don’t feel comfortable with either toilet and just to break gender roles as a whole. The children in the shout out workshop where very co-operative and asked questions when needed. It made me realise that just because a person seems a certain way doesn’t mean that they’re not as accepting or understanding as anyone else they may just need a better understanding of the subject. I have also been to The Princes Trust to see how another youth organisation works and it was a good experience as it was nice to see that there is help out there for young people who might be struggling and they can then receive help through The Princes Trust and also if needed they can get essential skills. They also provide food for the young people to independently make as some of these young people may not eat throughout the day as they are not able to but The Princes trust allows them to be independent and to be able to eat and socialise in between classes and meetings ect. Cara-Friend got called into The Princes trust to help with a young person who was struggling and part of that struggle was to do with sexual orientation and they didn’t want to upset the young person in anyway if they said the wrong thing and it made me happy that instead of trying themselves to help with little knowledge they called someone with more understanding and knowledge to help. It made me happy because it showed that they genuinely wanted to help and really wanted the best for the young person and that’s what I want to do I want to be able to help many young people as possible even if it isn’t me myself and its just me calling someone else who is more experienced with a certain topic to come in and talk to them to help even further it will still be able to help the young person and show that I do care and I do want the best for them. Last but not least on placement I have done research to find the young people who attend Cara-Friend workshops to be able to participate in. I thought this was going to be one of the easier parts of my placement but I was wrong I was soon to find out that finding workshops for youth groups is quite difficult and you have to look very hard to find them. It took a while but I managed to find a few places that I felt the young people would be interested in and benefit from such as mental health workshops, trans fashion tips and tricks workshops and art workshops. This placement has made me more confident in myself and less nervous to meet new people which has been something I have struggled with from a young age as I was always very quiet until I became comfortable around the people I am with. This new confidence will help me later in life as being able to talk to new people is a key skill needed in youth work and social work as I will be meeting new people on a daily experience and will be meeting new children often and will need social skills for me to be comfortable and them. I have also been educated more on the LGBTQ+ community by observing training sessions and workshops this will help me in the future as I can then be educated in a more diverse way and be more inclusive in my youth work or work in general. With my future with Cara-Friend I would love to become a volunteer and work alongside other volunteers to help build a change for LGBTQ+ young people in Northern Ireland and it will be a good experience for me and I would love to be able to be trained up as a volunteer is well as it would be good for me to have that training. It will also be helpful when applying to universities so that I can further my knowledge and qualifications in a social care work place. Overall my placement was a very pleasant and eye opening experience, it helped me to gain confidence. I gained a lot of experience and got to see how different parts of youth work work and see if it’s something I would like to do in the future which I now know for sure that it is and I hope to become a volunteer by the end of this year and gain even more experience.